The rug is very soft and the colors are just as pictured. It goes very well in our living room. Dress your floor in the tremendous colors of this Nourison Grafix area rug. 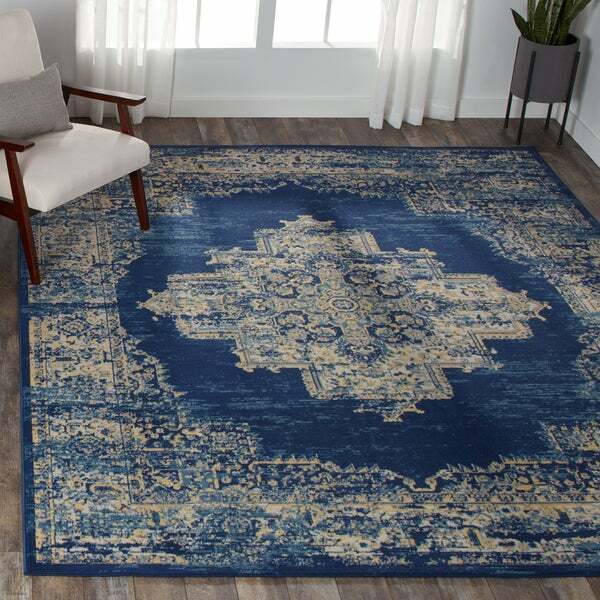 This rug is made with comfortable 100-percent polypropylene material and features a vivid medallion pattern that will make this bold rug stand out in any room. LOVE LOVE LOVE, that's the best way to describe this rug. 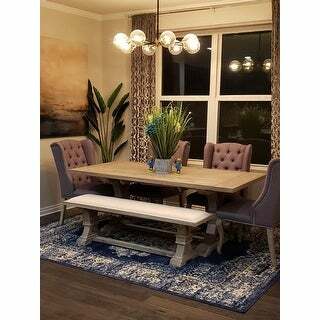 This low pile distressed style rug is perfect for our large formal living room. Our family lives in a large rental so I rely of rugs for pops of color in an otherwise "beige" home. This was the perfect addition to our living room with hard wood floors. The contrast between the wood and the area rug looks so elegant. I also purchased the smaller 5x7 size after this one for our entry way to tie the two areas together. Very nice quality for the price and size. This is a low pile rug that needs a pad underneath if you are looking for a cushier feel. I purchased a non-skid pad for underneath to keep it from slipping on our hardwood floors and it's been perfect. It’s just as beautiful in person. It’s soft and rolled out &amp; lays great. I put this over carpet in my bedroom &amp; it’s thin yet very soft. I mean- just couldn’t beat the price on this. I’m really very pleased with it. 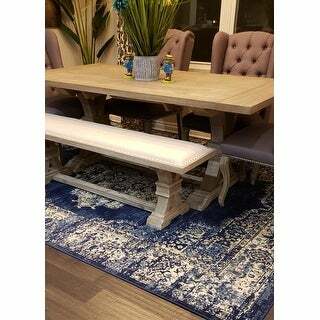 GOOD QUALITY & COLOR, WE REALLY LIKE THIS AREA RUG. Beautiful Rug! Very Satisfied with this purchase! Do you have a 2 x 3 area rug in this pattern? The colors oh the rich colors. 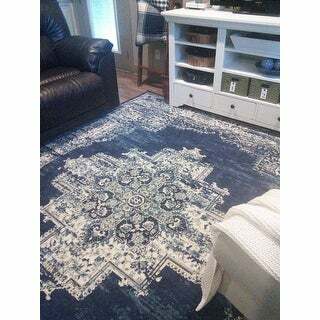 I am absolutely in love with this blue rug. I love the print, as i can fully appreciate the design since i ordered the 8X10 size. 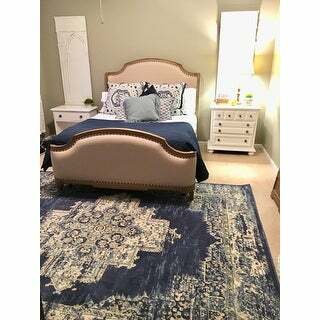 I am truly in love with the quality as this is my 8th rug from overstock. I would recommend and buy this item again. I don't understand all the glowing reviews.. 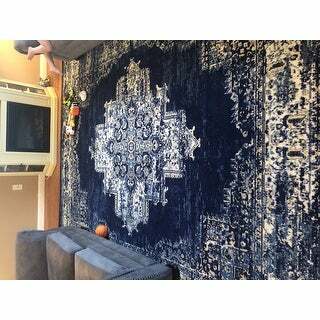 I bought this rug on deep clearance plus additional percentage off when OS was running a special. I had just had to dispose of a marvelous, plush wool rug due to a now dearly departed cat becoming increasingly incontinent in her old age. Anyone who has ever dealt with this problem knows there are few things on this earth that smell as horrible as cat pee and are as difficult to remove. After disposing of my beloved rug, replacing the floor, AND steam cleaning absolutely everything in my house, I was still leary of spending too much money on something I liked too much to only end up having to throw it away, as the departed cat's "sister" is pushing 17. Enter my solution: this rug. The pattern, price, and colors seemed ok, and there were so many glowing reviews that I decided to purchase it ( I bought the navy blue one) . And yes, all those things are ok, but I'm less then happy with the thickness. I knew it would be thin from reading the specs, but WOW, I have Time Magazines thicker than this. Ok, that's a bit of an exaggeration, but just a bit. And yes, I got it on sale, but I'm still not convinced that it was worth what I paid. 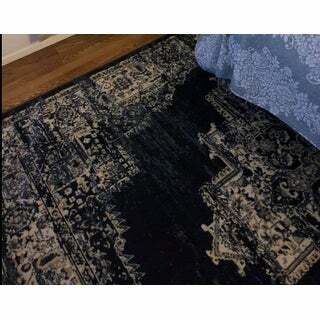 Obviously I'm a bit of a rug snob, but I've had plenty of synthetic rugs before (all sadly in the dumpster along with the wool one, thanks to Dead Kitty), and I've never seen or felt one quite this thin. It ripples and buckles very easily, and you barely notice there is anything between your feet and the floor when standing on it, it is that thin. I would need to spend more on an extra-thick rug pad than the rug itself to make it comfortable. It is essentially just a cheaply made floor covering that is slightly better than nothing.I suppose that will make it easy to dispose of when the time comes, lol. One good thing about it being a super thin, synthetic rug is that steam cleaning it is a breeze. Thankfully my remaining Golden Girl is still using her litterbox, but she has always had a hairball problem that is getting worse with age... 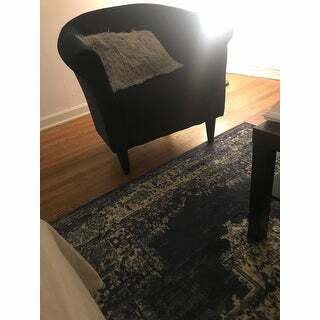 So this rug works for my current circumstance, but if I had bought it thinking it was a great deal on a high quality rug, I would have been very dissapointed. Should I need to replace it before my cat crosses the Rainbow Bridge, I will shop my local brick and mortar discount stores rather than reordering this. I'm sure that I can find better quality at a comparable price. 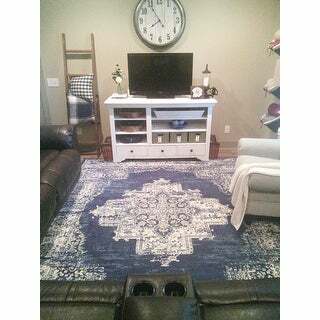 This rug with the pattern and blue color design is perfect for my family room. 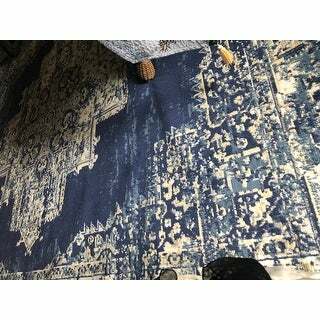 I have blue as the dominant color in the room, and this rug is perfect. I will be putting down the rug and padding after Christmas. Bought two. Arrived as described. The colors are vivid and the rugs are well made. Completed the vision I had for my rooms! I may have to order two more! Recommended. Gorgeous color and great size! This rug would add beauty and color to any room! I love the design and the contrast between colors! 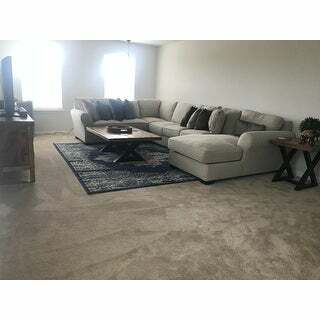 Nice areas rug...I bought this for my family room...makes a nice accent rug....good quality! I like the rug. It is true to the ad picture. It is not a dark Navy and does have beige, not peach or yellow. It is very thin, as other reviews have said. I like it! The house looks beautiful. Rug looks great in living room and matches my chair. Love it! Beautiful rug with muted colors and easy to clean. Adds a little kick to our dining area. The price was excellent and fast shipping! Love Overstock!! Good color, a true bright navy. We love how the rug enhanced our space. Needed a new rug for the dining room. Bought the 7x9 size and it fits perfectly! Delivery was super fast - 2 days! Rug is thin but exactly what works under chairs and table. The blue color is exactly what I wanted with beige/cream/white accents. Classic and can’t beat the price! This rug is truly beautiful. 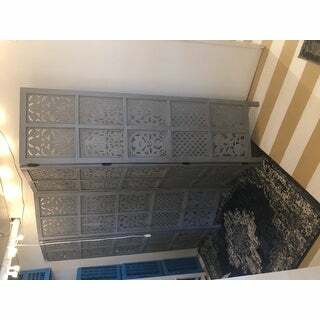 The design is very elegant looking and goes well in our space. We are very pleased with the quality too. It was a great purchase. 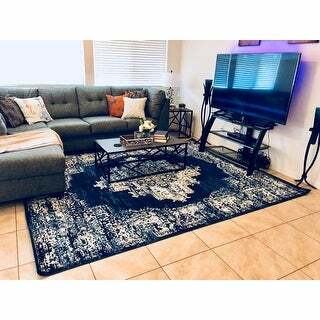 We love it so much we are considering purchasing another rug like it in a different size. 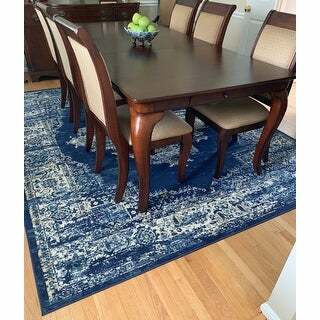 Thank you, Overstock, for carrying such beautiful rugs! Awesome color, great price, this rug I ordered the wrong size but it's ok ,it still looks great in my office. I will post photos soon. I'm redecorating. Beautiful colors, came earlier than I exected but will defineintely be using it. Love the color schem it will create in my new living room with several other pieces from Overstock! This item as a runner was not the greatest looking rug for the price. Although I do think that this rug may look better had it been larger and able to show more of the rug pattern. In my opinion the image of the looks better than what you get in person and this is why I gave 3 stars. "what is the other colors in the black rug?" The other colors are black, cream, ivory and hints of yellow. "does this rug come in a 5/5 by7/11 size?" No, this is not available in this size. "Can you wash this rug in the washer?" No it is recommended to spot clean or to take it to a professional/dry cleaner. "Would this rug be able to be folded instead of rolled?" "Does this rug come in 5x7?" Yes it does. I just ordered the 5x7 size for my entry way after really liking the larger size for my living room. "Besides the blue and cream colors, does this rug have peach? Also, does it have yellow? Any other colors?"